Graphs at a glance: Governor of the Bank of England said the housing boom is the greatest threat to the UK recovery. So what are we doing about it? Does the UK Housing Boom really exist? It's common knowledge that London house prices have ballooned, but is the rest of the UK bubbling up too? Figures from the Office for National Statistics show this is actually not the case. 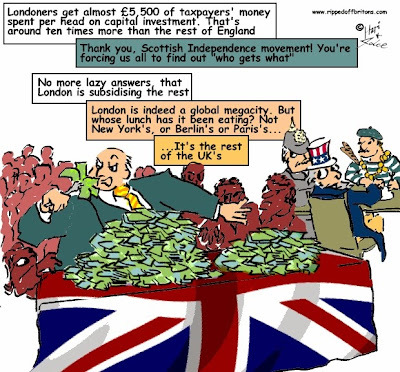 Since the banker induced economic crisis of 2008 London house prices have rocketed by 40%. UK house prices too have grown by a not insignificant 12%. However this average UK house price rise has been greatly inflated by including London's figures. The company can say it gave its staff an average £5,000 payrise. But strip out Felix's hike, and the reality is Joe got nothing. If you strip out London house prices, as the ONS has kindly done in the graph below, you discover that in the five and a half years from January 2008 to July 2014 the average house price in the UK excluding London has risen by just 4%. That is about the same as if you put your money in a rip-off deposit account paying less than 1% for the same period of time. Take an even closer look, and you will see that as at July 2014 house prices in Wales, the North East, the North West, and Yorkshire & Humberside had not even returned to their 2008 values. And Northern Ireland house prices were on average 40% lower than 2008. House prices in London, together with its hinterlands of the East and South East, have soared away from the rest of the UK. Why? Because that's where the money is. Not just the high paying jobs, but it's also where the government showers public money. From infrastructure (in 2013 London got £5,426 per person, compared to £223 per person in the North East) to the Arts (in 2012/13 London got £68.99 per person, compared to an average of £4.58 for the rest of England), London gets the lion's share. The London house price bubble is the result of simple supply and demand. People come to London in spite of exorbitant house prices, because that's where the money is. 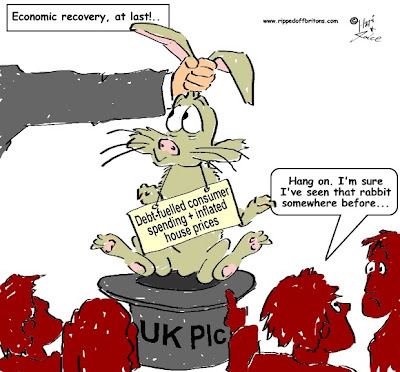 "The biggest risk to financial stability, and therefore to the durability of the expansion – those risks centre in the housing market"
The solution to making more people experience the benefits of and to remove the 'biggest threat' to the recovery is to move the money - the well paying jobs and public investment - out of London to the rest of the UK. We should not build new houses and more cramped communities where the jobs are currently. 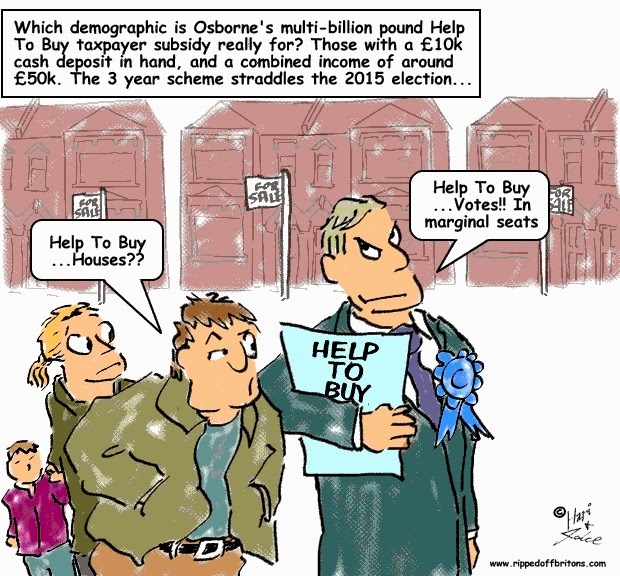 Nor should we pump up London prices by providing mortgage subsidies for bumper borrowing. We should move the jobs to where houses and communities already exist, well outside London. Perhaps the Scots did us all a favour when they won 'devo-max' and the prospect of an "independent England". An English Parliament based somewhere away from the South East, pursued by all the corporations hungry for government contracts would be a good start to redistributing the prosperity across the UK. Interesting data from the ONS: Though Northern Ireland has had the most calamitous fall in house prices and lowest averaage wages they have the highest "Life Satisfaction". And while London has the greatest increase in house prices and highest average wages, they have the lowest "Life Satisfaction".